Objective: To assess the dental health awareness, attitude, oral health-related habits, and behaviors in relation to socioeconomic factors among the municipal employees of Mysore city. Study Design and Methodology: This study was cross-sectional in nature and involved completion of a predesigned structured questionnaire. The questionnaire included multiple option questions to collect information on awareness on dental diseases, visit to dentist, reasons for visit, reasons for not visiting dentist on routine basis, oral hygiene practices, and deleterious oral habits. Modified Kuppuswamy scale with readjustment of per capita income was used to classify individuals into different socioeconomic status (SES) categories. Data were entered onto a personal computer and analysis was done using SPSS version 14. Results: Awareness on dental diseases was 100% in upper SES and nil (0%) in the lower SES. Visit to dentist in the last 1 year was 100% in the upper SES and 32.3% in the lower SES. 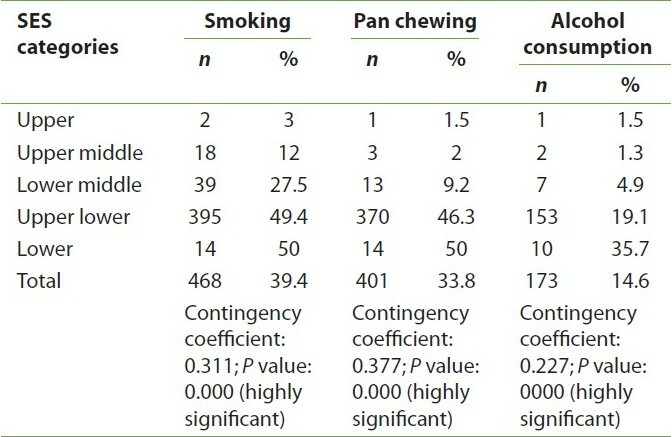 The prevalence of smoking, pan-chewing, and alcohol consumption was high in lower SES than in upper SES. Oral hygiene practices were better among the subjects in upper class than the lower ones. Conclusion: A direct relation was noted between the favorable dental health awareness, attitude, oral hygiene behavior, and SES. Municipal Corporation is a body consisting of employees of different socioeconomic categories from a high (commissioner, deputy commissioner, health professionals, engineers, administrative officers, etc.) to a low socioeconomic class (sanitary workers, gardeners, gang men, etc.) under one organization. The literature on the dental awareness, attitude, and dental health behavior among the municipal employees in India is also not available in the published dental literature. The assessment of these employees will provide an opportunity to assess the relationship between socioeconomic factors and dental awareness, attitude, and dental health behavior. Modified Kuppuswamy scale considers the education, occupation, and income of the head of the household. 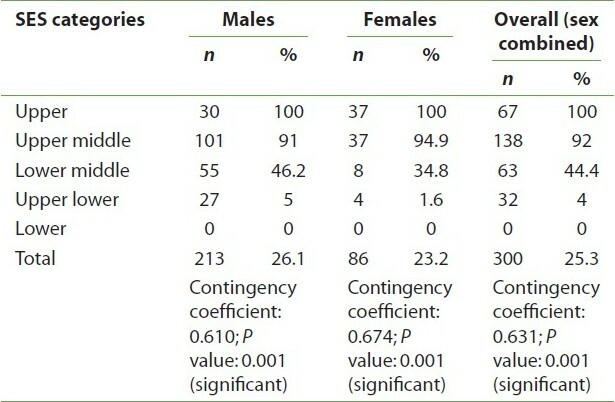 Each of these parameters was given weightages and then the total of these three indicators was taken to determine the SES of the individual [Table 1]. The readjustment of the per capita income in the scale was made after obtaining the expert opinion from the department of Economics and Co-operation, Manasa Gangothri, a reputed university, in Mysore, Karnataka, and the concerned statistician. The basic pay scales of all the 20 classes of state government employees ever since the first pay scale revision (1970) to the latest pay scale revision (1998) was collected. The change in the basic pay of each class of employees from 1985 pay scale (pay scale at the time when Modified Kuppuswamy scale was introduced) to 1998 pay scale (pay scale at the time of study) was noted. The basic pay of each class of employees in 1998 pay scale was divided by the basic pay of the respective class of employees in the 1985 pay scale. The average of this was taken. The average was then multiplied to the original per capita income in the Modified Kuppuswamy scale. The fractions were rounded off to the nearest whole number while readjusting the ranges in the per capita income of the Modified Kuppuswamy scale. The weightages of different items in the Revised Modified Kuppuswamy Scale for determining SES are denoted in [Table 1] and [Table 2]. The questionnaire also included multiple option questions to collect information regarding their awareness toward most common oral diseases such as dental caries, periodontitis, and oral cancer, awareness on the provision for reimbursement for dental care, dental visits, the reasons for the visits, the reasons for not visiting a dentist on a routine basis, smoking, pan-chewing, alcohol consumption, and oral hygiene practices. Three multiple option questions each on the causative factors and prevention for dental caries, periodontal diseases, and oral cancer were asked. Each correct answer was given a score of 1. If an individual has given at least five correct answers out of nine, he/she was considered to be aware about these common oral diseases. The questionnaire was filled by the investigator himself after obtaining consent from each of these study participants to avoid the misinterpretation of the questions and to ensure uniformity in data collection. The questionnaire was pretested with 30 selected study subjects on two different occasions separated by 10 days. The questionnaire was found suitable for application among the study population as there was high concurrence with the answers to the items on two occasions (Kappa test coefficient for all questions =0.96). The data were entered onto a personal computer, and statistical analysis was done using SPSS version 14. The statistical significance was fixed at 0.05. Chi-square test, cross-tabs, and contingency coefficient were used for analysis of the results. The awareness on the causative factors for dental diseases,  the attitude,  oral health-related habits, and behaviors , plays a vital role in determining the oral health status of individuals along with SES. ,,,,, The scarce literature on dental health awareness, attitude, oral health-related habits, and behaviors among the adult population in relation to socioeconomic factors in India prompted us to take up this study on the municipal employees of Mysore city that had all the classes of employees under one roof. B G Prasad scale considers only per capita income and does not consider the education and occupation. Modified Kuppuswamy scale appears to be more comprehensive for SES classification compared with other scales applicable in India. Although this scale has the drawback of not having the correction factor for readjusting the per capita income, the scale was chosen in the study with readjustment of the per capita income to suit the present levels for SES classification as it was relatively comprehensive. The awareness on the causative factors for most common oral diseases such as dental caries, periodontal diseases, oral cancer, the methods for their prevention and control, and awareness on the provision for reimbursement for dental care was better among the subjects in the upper class. The upper SES subjects tend to use the health and oral health services more frequently. The frequent dental visits facilitate the subjects in the upper class to gain more knowledge on the causes for oral diseases and their prevention, which is not the case among the lower class people. The favorable dental health attitude that develops because of dental visits drives the people in the upper class to seek information on oral diseases and apply the preventive procedures in their day-to-day life. The difference in the frequency of dental visits among the subjects in different SES categories may explain this difference in the degree of awareness. The results of our study were in agreement with the findings of studies by Newman et al. and Sanders et al. The dental visits were more frequent among the subjects in the upper class. Majority of the subjects in the upper class who visited dentist in the last 1 year did so for a routine dental check-up without any specific complaints, whereas a major bulk of the lower class people visited dentist to get remedy for an acute oral health problem. A look at the reasons for not having a dental visit reflected high cost and lack of attitude and motivation among the subjects in the lower class and lack of time among upper classes. The social pressure to retain the natural teeth and a pleasing appearance drive the upper class people into preventive action, whereas the high cost of sophisticated dental services may discourage the subjects in the lower class not to have a dental visit on a routine basis. They reserve the dental visit for an acute problem when all other possible methods to alleviate the existing problem have completely failed. This in the long run may result in the development of a negative attitude toward dentist and dental procedures among the people in lower classes. This suggests a bidirectional adverse relationship between attitude, dental visits, and awareness on the causative factors for dental diseases. The results were in line with studies by Gundala and Chava. The prevalence of various deleterious habits such as smoking, pan-chewing, and alcohol consumption were high among the subjects in the lower SES categories than in the upper ones. The lack of awareness on the ill effects of these habits among the subjects in the lower classes, scarce material resources, psychosocial stress due to an unfavorable social position, and poor material conditions explains this difference in the prevalence of deleterious habits between different socioeconomic classes as evidenced in the studies by Graham  and others. ,,, The oral hygiene aids used for cleaning the teeth and the frequency of tooth cleaning were better among the subjects in the upper classes than among those in the lower classes. The subjects in the upper class will have a better knowledge on the usefulness of oral hygiene aids and oral hygiene practices in the prevention of oral diseases which may be lacking among the lower classes. Besides, the lack of affordability to buy the oral hygiene aids may prompt the people in the lower classes to look out for cheaper alternates in the form of charcoal, mud, and so on along with finger that is detrimental to the oral health. The direct relationship between SES and oral hygiene practices has been documented in the studies by Davidson et al. and Ronis et al. The level of dental health knowledge, positive dental health attitude, and dental health behaviors are interlinked and positively associated with the level of education and income as demonstrated by studies in the past. ,,, All these studies have found the level of education to play a vital role, as, an educated individual gains the requisite knowledge from multiple sources. This in turn will drive these people to have a positive dental health attitude and behavior. Oral health care has been given a greater importance in many industrialized countries due to political and economic reforms. Comprehensive oral health educational programs were directed toward the professionals and the public, targeting the adults and the young in these countries. Health education attempts to change behaviors by altering an individual's knowledge, attitudes, and beliefs about health matters. However, educational oral health programs in India have been mainly conveyed to the public on a narrow scale by certain formal medical/dental institutes in the country. These efforts are limited and insufficient nationwide. There is a need for comprehensive national educational programs to improve the oral health practice, knowledge, and attitudes of the general population in the country as a whole. The data in this study indicate that a direct relation exist between the favorable dental health awareness, attitude, oral hygiene behavior, and SES. This suggests that the development and implementation of well-structured dental health education programs on periodic basis are needed to improve and maintain suitable oral health standards among municipal employees with special emphasis on the lower SES strata. I sincerely thank the Commissioner of Mysore city corporation, Professors in Economics and Co-operation department, Manasa Gangothri, Statistician, and the study participants for their kind support throughout the study. 1. Mahajan BK. Social environment. Textbook of preventive and social medicine. 1 st ed. New Delhi; Jaypee Brothers Medical Publishers (P) Ltd; 1991. p. 82-7. 2. Park K. Concepts of Health and Disease. Textbook of preventive and social medicine. 17 th ed. Jabalpur, India: Banarsidas Bhanot Publishers; 2002. p. 11-47. 3. Oliver RC, Brown J, Loe H. Variations in the prevalence and extent of periodontitis. J Am Dent Assoc 1991;122:43-8. 4. Burt BA. Trends in caries prevalence in North American Children. Int Dent J 1994;44:403-13. 5. Petersen PE, Christensen LB, Moller IJ, Johansen KS. Continuous improvement of oral health in Europe. J Ir Dent Assoc 1994;4:105-7. 6. Beltran-Aguilar ED, Estupinan-Day S, Baez R. Analysis of prevalence and trends of dental caries in the Americas between the 1970s and 1990s. Int Dent J 1999;49:322-9. 7. Petersen PE, Razanamihaja N. Oral health status of children and adults in Madagascar. Int Dent J 1996;46:41-7. 8. Petersen PE, Danila I, Dalean A, Grivu O, Ionita G, Pop M, Samolia A. Oral health status of school children in Romania. Community Dent Oral Epidemiol 1994;22:90-3. 9. World Health Organization. Global Oral Health Data Bank. Geneva: WHO; 2000. 10. Bratthall D, Hansel-Peterson G, Sundberg H. Reasons for the caries decline: What do the experts believe?. Eur J Oral Sci 1996;104:416-22. 11. Viglid M, Petersen PE, Hadi R. Oral health behavior of 12-year old children in Kuwait. Int J Paediatr Dent 1999;9:23-9. 12. Zhu L, Petersen PE, Wang HY, Bian JY, Zhang BX. Oral health knowledge, attitudes and behavior of adults in China. Int Dent J 2005;55:231-41. 13. Hilton IV, Stephen S, Barker JC, Weintraub JA. Cultural factors and children's oral health care: A qualitative study of carers of young children. Community Dent Oral Epidemiol 2007;35:429-38. 14. Monaghan N, Heesterman R. Dental caries, social deprivation and enhanced capitation payments for children. Br Dent J 1999;186:238-40. 15. Kinirons M, McCabe M. Familial and maternal factors affecting the dental health and dental attendance of preschool children. Community Dent Health 1995;12:226-9. 16. Szatko F, Wierzbicka M, Dybizbanska E, Struzycka I, Iwanicka-Franlowska E. Oral health of Polish three-year-olds and mother's oral health related knowledge. Community Dent Health 2004;21:175-80. 17. Jose B, King NM. Early childhood caries lesions in preschool children in Kerala, India. Pediatr Dent 2003;25:594-600. 18. Gatrix D, Taylor GO, Lennon MA. Mother's dental attendance patterns and their children's dental attendance and dental health. Br Dent J 1990;168:441-3. 19. Tsai AI, Chen CY, Li LA, Hsiang CL, Hsu KH. Risk indicators for early childhood caries in Taiwan. Community Dent Oral Epidemiol 2006;34:437-45. 20. Kneckt M. Psychological Features Characterizing Oral Health Behavior, Diabetes Self- Care and Health Status among IDDM Patients [article online]. Dissertation. Oulu, Finland, Institute of Dentistry, University Of Oulu, 2000, p. 16-8. Available from: http://www.herkules.oulu.fi/isbn9514256301/isbn9514256301.pdf. [Last accessed on 2006 July 18]. 21. Tash RH, O'Shea MM, Cohen K. Testing a preventive-symptomatic theory of dental health behaviour. Am J Public Health Nations Health 1969;59:514-21. 22. Kegeles SS. Some motives for seeking preventive dental care. J Am Dent Assoc 1963;67:110-8. 23. Timiº T, Danila I. Socioeconomic status and oral health. J Prev Med 2005;13:116-21. 24. Dagli RJ, Tadakamadla S, Dhanni C, Duraiswamy P, Kulkarni S. Self reported dental health attitude and behavior of dental students in India. J Oral Sci 2008;50:267-72. 25. District administration, Mysore. Information on the district and its administration. Available from: Link http://www.mysore.nic.in/[Last cited 2011 Jan 28]. 26. 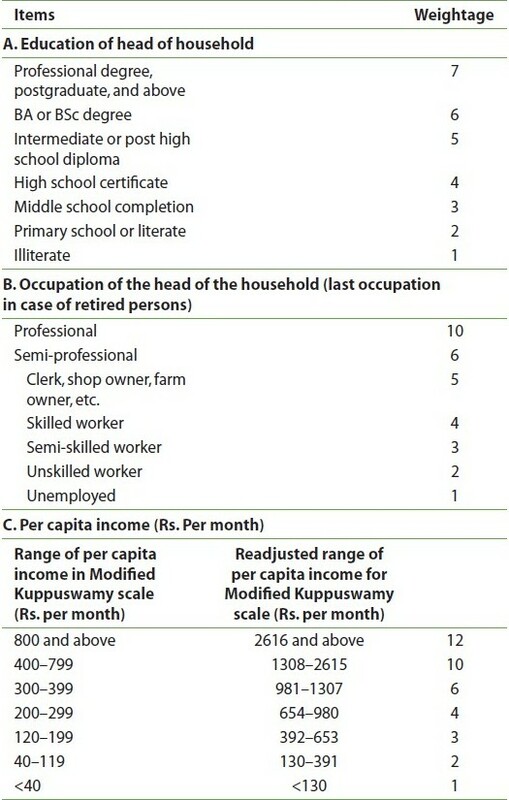 Kuppuswamy B. Manual of socio-economic status scale (urban). 1 st ed. New-Delhi, India: Manasayan Publishers; 1998: P. 2-18. 27. The Karnataka civil services rules (1999). Corrected up to 31-12-1998 and important GOK orders/Oms/Circulars incorporated under each rule up to 31-12-1998. Page 1233-41. 28. Agarwal AK. Social classification: The need to update in the present scenario. Indian J Community Med 2008;33:50-1. 29. Newman JF, Gift HC. Regular pattern of preventive dental services: A measure of access. Soc Sci Med 1992;35:997-1001. 30. Sanders AE, Slade GD, Turrell G, John Spencer A, Marcenes W. The shape of the socioeconomic-oral health gradient: Implications for theoretical explanations. Community Dent Oral Epidemiol 2006;34:310-9. 31. Trihart AH. Understanding the underprivileged child: Report of an experimental workshop. J Am Dent Assoc 1968;77:880-3. 32. Gundala R, Chava VK. Effect of lifestyle, education and socioeconomic status on periodontal health. Contemp Clin Dent 2010;1:23-6. 33. Graham H. Smoking prevalence among women in the European Community 1950-1990. Soc Sci Med 1996;43:243-54. 34. Cavelaars AE, Kunst AE, Geurts JJ, Crialesi R, Grötvedt L, Helmert U, et al. Educational differences in smoking: International comparison. BMJ 2000;320:1102-7. 35. Stronks K, van de Mheen HD, Looman CW, Mackenbach JP. Cultural, material, and psychosocial correlates of the socio-economic gradient in smoking behavior among adults. Prev Med 1997;26:754-66. 36. Gandhi G, Kaur R, Sharma S. Chewing Pan Masala and/or Betel Quid-Fashionable Attributes and/or Cancer Menaces? J Hum Ecol 2005;17:161-6. 37. Osler M, Jorgensen T, Davidsen M, Grosbeak M, Bronnum-Hansen H, Madsen M, et al. Socioeconomic status and trends in alcohol drinking in the Danish MONICA population, 1982-92. Scand J Public Health 2001;29:40-3. 38. Davidson PL, Rams TE, Andersen RM. Socio-behavioral determinants of oral hygiene practices among USA ethnic and age groups. Adv Dent Res 1997;11:245-53. 39. Ronis DL, Lang WP, Farghaly MM, Passow E. Tooth brushing, flossing, and preventive dental visits by Detroit-area residents in relation to demographic and socioeconomic factors. J Public Health Dent 1993;53:138-45. 40. Al-Wahadni AM, Al-Omiri MK, Kawamura M. Differences in self-reported oral health behavior between dental students and dental technology/dental hygiene students in Jordan. J Oral Sci 2004;46:191-7. 41. Kawamura M, Iwamoto Y, Wright FA. A comparison of self-reported dental health attitudes and behavior between selected Japanese and Australian students. J Dent Educ 1997;61:354- 60. 42. Barrieshi-Nusair K, Alomari Q, Said K. Dental health attitudes and behaviour among dental students in Jordan. Community Dent Health 2006;23:147-51. 43. Kawamura M, Spadafora A, Kim KJ, Komabayashi T. Comparison of United States and Korean dental hygiene students using hiroshima university-dental behavioural inventory (HU-DBI). Int Dent J 2002;52:156-62.